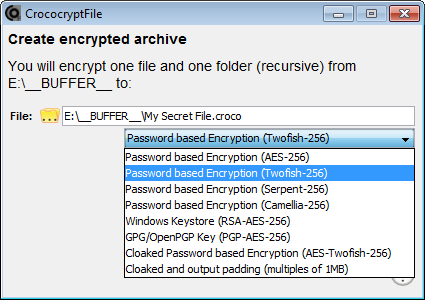 HissenIT released a new version of the file archive encryption tool CrococryptFile. Three new crypto suites using Twofish, Serpent, and Camellia are included. Moreover, the hash iteration count in case of password-based encryption following PBKDF2 is now selectable by the user (which is backward compatible). Version 1.5 is now available as free download. For more information, release notes, and the download packages just visit the CrococryptFile Homepage. In cloaked or headerless mode, a (maybe) "giant" encrypted file dump is created without any header and without any file extension. The resulting file looks like a file with solely random binary data. No connection to any program or software can be made. Moreover, arbitrary random data can be added to the file's end to disguise the original file's or files' size. Using a huge iteration count (that might result in a long time to calculate the derived encryption key) might be an additional security measure. The resulting file could be stored in a personal Cloud storage as secure long-term archive. The tool's developer, HissenIT, is a small business company in Germany focusing on IT security software development and consulting. Founder and computer scientist Frank Hissen has over 14 years experience in various positions as security expert in IT projects. HissenIT offers Java-based security, cryptography and encryption development as well as consulting services and free file encryption tools.